Innovation these days in the way-too-crowded overdrive pedal market is rare. Is there anything at all that hasn’t been tried when it comes to stepping on a pedal and making your sound heavier, dirtier, or grittier? Steen Grøntved, founder and chief engineer at LunaStone (along with his team of former TC Electronic execs/engineers), thinks there is. Can his offerings be any different? Introducing a pair of pedals from an innovative new company: the LunaStone TrueOverDrive 1 & 2. Taking their brand name literally, luna meaning moon and stone meaning rocks, we confirmed there are (sadly) no moon rocks nor space dust in these pedals to make extra mojo for your guitar tones. There are, however, some truly great sounds built from actual terrestrial components that might just lift your tone into the stratosphere… or, perhaps, the Les Paulosphere? 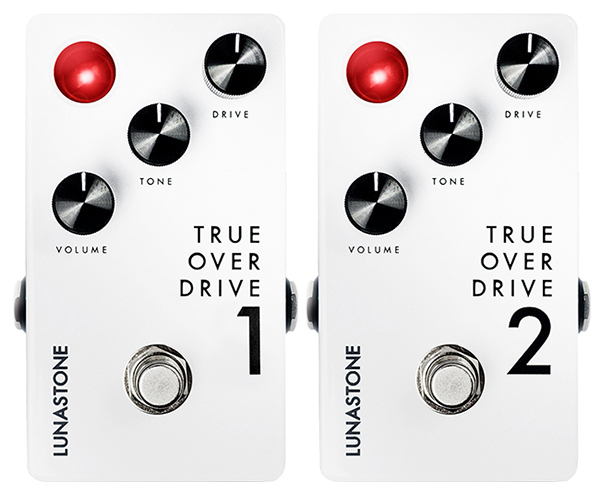 The LunaStone TrueOverDrive 1 & 2 are identical in feature set and usability. This is probably for the best, being we give these pedals high marks in these sections. Featuring a solid metal housing, these pedals are tough and built to last. The relay-type, single, stomp switch assures both easy and noiseless switching. A standard barrel-style 9V power input on the back of the pedals plays nicely with all of the power supplies we own. Interestingly, the TrueOverDrive pedals do not use diode clipping to achieve their sounds. Rather, they use a cascading gain stage approach, much like the tube amps we know and love. 3.6 Stars, which earns it a WIHO Award! The three knobs on the pedals are labeled Volume, Tone and Drive. This is common and typical enough, however they’re laid out in an interesting diagonal format. A highly visible, extra-large, red indicator light appears in the top left corner of the pedal to indicate On or Off status. Standard quarter-inch inputs and outputs are found on the sides of the pedal. These pedals are true bypass, so if you are running long cable runs, you may desire a buffer before this pedal (Not an issue if you run a wireless system or keep your cable runs under 20 feet). We should also point out the all-analog design. For tone purists, there is absolutely no digital conversion going on inside these pedals. The TrueOverDrive 1 & 2 pedals were simple to swap out with our favorite overdrives on our pedalboard. They were quite literally plug and play. We powered these pedals from an Eventide Powerfactor 2 power supply as well as a BOSS PS-A adapter, though you can install a 9V battery in the unit (four screws to remove the bottom plate). An interesting feature was when we disconnected power to the pedal, we still had signal and were able to continue playing. Thank you, true bypass! The sweeps of the knobs were useable across their range, and the diagonal layout enabled us to make changes with our feet. No, we couldn’t truly zero in and bring something up or down precisely in this manner, but if we needed a little more or less of something while mid-song on stage, each knob was accessible without interrupting our performance. Four rubber feet kept the pedal off the floor, in place, and were pretty sturdy. Human feet are clumsy and on-the-fly adjustments call for a pedal that’s well planted. We have more than one pedal on our board with lights brighter than a high-end SUV’s headlights. Note to every pedal manufacturer: check out LunaStone’s indicator lamp! On a dark stage or even in daylight, there is no question as to pedal status, yet it cannot be seen from outter space. The indicator lamp is soft on the eyes and perfectly functional. We were very grateful for this feature. The relay-type switch on these pedals had a smooth feel, and enabled easy use at home in our socks. They may look like Carling-style switches, but our shoe-less feet were happy to note that they functioned with minimal effort. As a matter of fact, there was no click at all—just silent, smooth switching. LunaStone’s TrueOverDrive 1 & 2 pedals were so similar in form, feel, and function that we questioned if this could have simply been one pedal with a toggle switch [Editor’s Note: The True OverDrive 1 pedal was released first]. Happily, both pedals feel and play like real amp circuits. They both react to your guitar’s volume knob and clean up nicely as you decrease input to the pedal, much like our amps do. Unlike the overdrive pedals of yesterday, these truly do not sound like pedals in front of an amp. And this is where the similarities end between these two fantastic pedals. Our first sound test was in our home studio with the purest-sounding clean amp we own, the Fender ‘57 Pro reissue. This is a no-nonsense tone type of amp and an excellent, pure-tube-goodness platform for an overdrive pedal sound test. We fired up the TrueOverDrive 1 with the levels at 12:00, and instantly turned 1957 into early ‘80s AC/DC, British-inspired awesomeness. At this setting, we were able to achieve early ‘80s Marshall JCM800-type tones. We loved it! The pedal also reacted well to an almost pure, clean tone when we decreased the guitar’s volume. More gain on the pedal brought us into a more modern sounding, modded British amp, kind of sound. This was perfect for today’s hard rock sound, with plenty of mids and sizzle to provide fantastic presence. The sustain was also something to note, as the TrueOverDrive 1pedal let notes ring out beautifully and nearly endlessly. Furthermore, with the gain dimed out, the pedal was still quiet to a fault. This pedal makes a formidable tool for recording, and was one of the best sounding overdrives we’ve had the pleasure of testing in a long time. Plugging in the TrueOverDrive 2 gave us similar results, albeit in a darker, heavier sounding pedal. Gone was the nice, big openness of its companion pedal, replaced by scooped mids, enhanced bass, more gain, and a somewhat quicker attack. We felt this pedal was better suited to a more modern, heavier style of music. This pedal was particularly nice to play shred lines on, given its sustain and higher levels of gain on tap. “In your face” is how one tester described the tone. And when placed in the clean channel of a high-gain, multi-channel amp such as the ENGL Powerball II, we had a hard time discerning the tone from the LunaStone pedal vs. the tone from one of the amp’s overdrive channels. Impressive! However, due to the second pedal’s intended design and use, it sounded a bit hollow at lower-gain settings and did not clean up quite as nicely as the TrueOverDrive 1. We took the TrueOverDrive 1 out to a local gig and used it to juice the front end of a Mezzabarba Mzero Overdrive 100w head mated to a Friedman 4x12 cab. We set the gain on the pedal fairly low, given we love the sound of this amp already and just wanted to use the LunaStone pedal to give us a little extra push and sustain for our leads. We found with the level a little past 12:00 and the tone knob around 5:00, we really loved how the pedal changed the feel of the amp for our lead work. This pedal is staying on our board for the foreseeable future, while one of our more prog rock-minded editors intends to find a permanent home for the TrueOverDrive 2. You really can’t go wrong with either pedal depending on your tone preference. But for overall versatility, we give the nod to the TrueOverDrive 1. The pedals come with identical Quick Start guides, and assuming you’ve used other overdrive pedals, no documentation is really needed to get up and running with or without a pedalboard. All LunaStone pedals include a two-year warranty. The Lunastone TrueOverDrive 1 & TrueOverDrive 2 each sell for approximately $159. This is middle-of-the-pack pricing for quality overdrive/distortion pedals, but given the superior build quality, amp-like response and tone, we find the LunaStone pedals worthy of serious contention for a spot in your rig.